A pocketspring mattress is the right mattress if you like a comfortable mattress with punctual support and good ventilation. 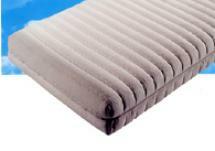 The core of a pocket spring mattress consists of metal springs which are individually packed in a cotton bag. These springs operate separately from each other. On both sides of the mattress core, the cover layer has a cold foam. The mattress is divided in comfort zones with different degrees of hardness, which provide a correct support. Important for the preservation of the mattress is to reverse these regularly.